Hillary Clinton is taking flak today for her summary repetition of the white supremacist Dunning School of historical interpretation, which held that the attempt in the 1860s and 1870s to provide African Americans with their civil rights was a terrible imposition on the white folks of the South. [Lincoln] was willing to reconcile and forgive. And I don’t know what our country might have been like had he not been murdered, but I bet that it might have been a little less rancorous, a little more forgiving and tolerant, that might possibly have brought people back together more quickly. But instead, you know, we had Reconstruction, we had the re-instigation of segregation and Jim Crow. We had people in the South feeling totally discouraged and defiant. So, I really do believe he could have very well put us on a different path.… let’s also think about how we do try to summon up those better angels, and to treat each other, even when we disagree, fundamentally disagree, treat each other with more respect, and agree to disagree more civilly, and try to be inspired by, I think, the greatest of our presidents. In the current Los Angeles Review of Books Quarterly Journal Michael W. Clune1 writes about odd small episodes, “particularly ephemeral perceptual experiences” we have that may alert us to the gap between how things seem and what they are. Riffing on Rei Terada’s Looking Away, he lists mirages, after-images; “clouds taken for mountains … looking at a landscape with one’s eyes half-closed so that it appears underwater.” He notes that we have nothing to say to each other about these experiences even if we share them, but that they remain with us. They remind us that if we pay too much attention to the mechanism by which we draw meaning from appearance we attenuate that meaning. One of Clune’s examples is an imaginary exchange with a sales clerk about money. A year from today, the US will inaugurate a new president. But inauguration day has not always been thus fixed. In the early years of the Republic, habit (rather than statute) placed the date of inauguration at March 4—though even that convention was not quite firm. In 1821, with the incumbent President James Monroe about to take the oath of office for his second term, March 4 fell on a Sunday. Monroe asked of Chief Justice John Marshall whether he could take the oath on the following day, rather than sully the Lord’s day with secular business. In determining that a trough occurred in June 2009, the committee did not conclude that economic conditions since that month have been favorable or that the economy has returned to operating at normal capacity. the inevitable happened: measured in terms of industrial output, our current recovery was overtaken by that of the interwar period. Pretty dismal stuff. So now, having avoided quite so severe a contraction as the 1930s, we are suffering a less impressive recovery. What do we call this ongoing period? “Malaise” is taken, and rather ruined, by Carter-related discourse. I’ve lately been suggesting “the great economic unpleasantness” but without, I confess, really expecting it to catch on. Krugman’s old “Lesser Depression” is looking depressingly correct. Non-specific plot details discussed herein. 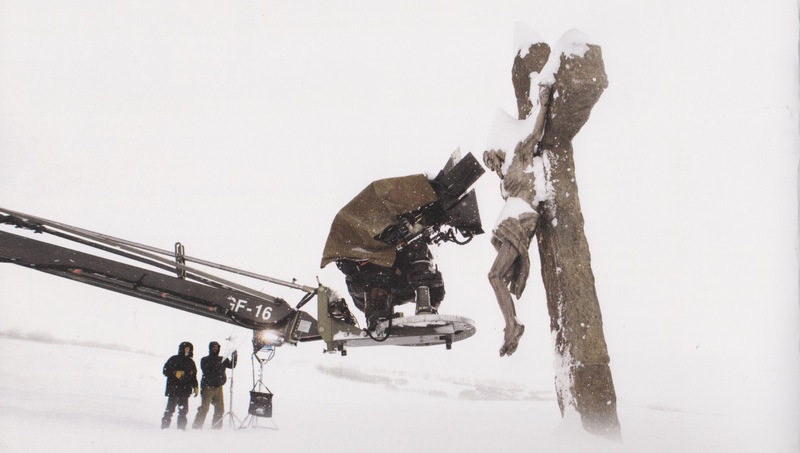 Quentin Tarantino’s The Hateful Eight opens with a close shot of Christ’s face as he hangs on a cross; the frame widens to show us it’s a roadside crucifix somewhere in a desolate snowscape. Along that road sweeps a stagecoach bearing a bounty hunter—whose dual nature is revealed in his nickname, “the hangman,” and his surname, which is Ruth, meaning mercy—together with his prisoner, a murderer and thief. The film so swiftly displaces the lingering shot of the stationary crucifix with the rush of the coach, which is seeking to beat a blizzard to shelter, that perhaps by the end of the film a viewer has forgotten the opening invitation to contemplate the image, and concept, of redemption-through-suffering. But that is where the movie starts, and also where it ends. The opening shot looks a lot like the beginning of Samuel Fuller’s The Big Red One, which also opens on a long close shot of a crucifix, this one in France during World War I—or rather, in the hours just after the armistice, when Fuller’s protagonist slays one more German before finding out his license to kill has expired. Fuller’s movie is largely about how arbitrarily, but how completely, the declaration of war permits human slaughter. It mocks the idea of meaning emerging through violence; it mocks meaning altogether, I think. There is only survival and, where permitted, empathy. By invoking it—we know Tarantino admires Fuller, and shares some of his preoccupations—is the Hateful Eight doing the same? Maybe; I think it may go further. In Fuller’s movie the hate between antagonists switches off instantly once the war ends. In Tarantino’s, the hate persists and intensifies after the war. Denied the outlet of legitimate killing, hate finds other ways to erupt. War gives way to guerrilla fighting, terrorism, outlawry; murder after murder. For Tarantino, “war” here is specifically the US Civil War. In the film, the artifact embodying the myth of this war’s meaning is revealed literally to be a lie. The Christ crucified of the Civil War—Lincoln—has brought no redemption. Indeed the only “Redemption” in the offing—the end to any attempt at Reconstruction of the defeated South—will repudiate the purpose for which the war was fought. Tarantino’s Pulp Fiction can only give its main characters what seems like a happy ending by twisting the order of the tale, and ending in (what the film lets us know is) the middle of the story. Apart from a fairly conventional flashback, The Hateful Eight proceeds more or less chronologically to its conclusion. That flashback shows us an evidently idyllic Minnie’s Haberdashery in the hours before the movie’s main action begins—a place where black and white people live in blissful harmony and women are in charge, driving the action. On an uncareful reading, one might assume this flashback is supposed to tell us that the West really could have been a new and better society (it is, after all, Wyoming territory, the first to enact woman suffrage)—but Tarantino undercuts this illusion too, making Minnie’s hatred of Mexicans into a plot point. There was already a serpent in the garden then. Straightened out, the film’s narrative begins with this false Eden and ends with a mocking Calvary. One of its most thoughtful monologues comes from Tim Roth’s character, who muses that justice demands that an executioner act without passion. A passion play ends with a crucifixion. This movie ends with another kind of execution, and none are saved. Even in free countries it is sometimes necessary to alter the past to suit the present. For instance, I recall the day at my English boarding school in the early 1960s when our sober, patriotic old history books were gathered up and carted away to a storeroom. In their place we were handed bright, optimistic replacements, with a good deal less to say about the empire, the Protestant martyrs or what we had been taught without embarrassment to call the Glorious Revolution.… Older English people look back fondly on 1940, when we supposedly stood alone. In fact we were a major industrial and exporting power with a global navy, more or less self- sufficient, nationally cohesive and bolstered by the tribute of a still-great empire. Now all of that is gone. Is it possible that, after a thousand astonishing years, our island story has finally come to a full stop? Will the next great history of our nation and people be written in Chinese? Now that George MacDonald Fraser has died, the sources for such views of the empire and its history seem fewer each day.